Save SAR 125 (69.83%) – Earn 5 Shukrans What is Shukran? Shukran is the Landmark Group’s award-winning loyalty programme in the Middle East, which allows you to earn Shukrans when you shop any of our brands. 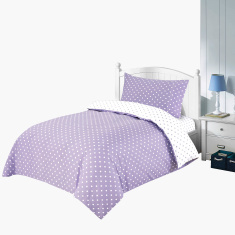 Instantly transform your kid's room with this simple and elegant duvet cover set. The soft material used to fabricate the duvet cover and the matching pillow case make it an indeed must-have.